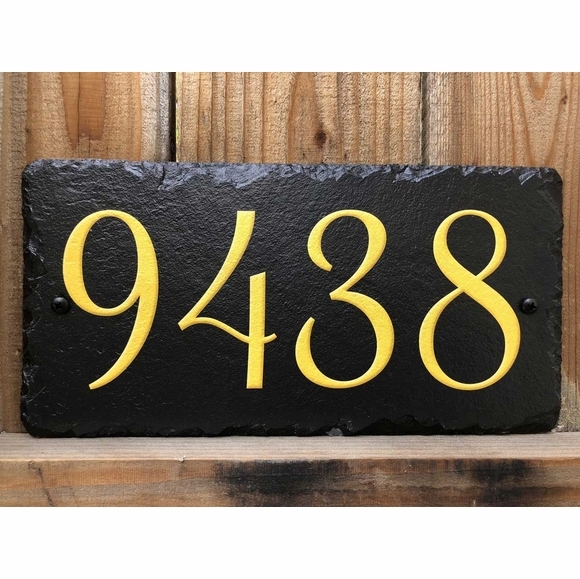 Slate House Number Sign with Giant Gold Numbers - - that almost fill the entire plaque. Made in USA. Numbers are approximately 1.5" smaller than the slate surface. Two colors: black and brown. Holds up to six (6) giant numbers. The text on this plaque has an embossed effect. This plaque is NOT engraved and has a flat finish. Colors: black or brown with gold numbers. House number in large image: 9438.